Assorted Notions: "What are you going to make?" I have a few wool garments that I made last year. I didn't pre-treat the fabric, I haven't taken them in for dry cleaning yet, and now I am afraid to because I'm worried they'll shrink. I wouldn't be completely crushed, but still it would be a loss (and a gain for someone shopping at Goodwill, I suppose). So I decided to go on the offensive here and pre-treat the wools I bought earlier this week. Me: Hi. I'm going to use this fabric to make some garments, a coat and a dress. Should it be steam pressed first so that it won't shrink when I get the clothes dry cleaned later? Her: Oh? You are going to sew this? You are so talented! What are you going to make? Me: A coat and a dress. It's wool. Is dry cleaning going to shrink it if I don't have it steam pressed first? Her: Oh I don't think so, but I'm not 100% sure. I don't think so. What are you going to make? Me: A dress and a coat. So it's not going to shrink when it's dry cleaned? Her: You are so talented! I refrained from screaming "WHERE IS THE REGULAR LADY?!" and instead I just smiled, said thanks, picked up my fabric, and left. Maybe I should have stayed and asked her to steam press the fabric, but I wasn't thinking straight. Well, I am way too lazy to steam press the fabric myself, so I cut a few 4" x 4" swatches and threw them in the washing machine with a few other delicate cycle garments. I let them line dry overnight, and today I ironed them to get out some wrinkles. I traced each of the swatches before washing, and you can see that they all shrunk a little bit. 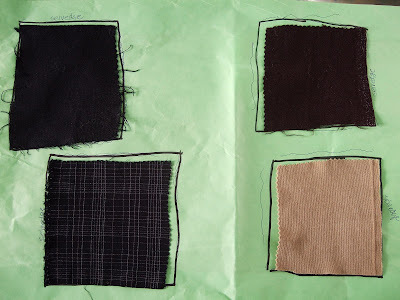 The good news is that the look and feel of the fabrics is unchanged. So, I guess I am going to have a little wool-washing party with these fabrics. When I buy wool in the future, I'd do the swatch test again, because I don't think all wools are going to turn out so nice after washing. The exchange with the woman at the drycleaners was tooo funny! Yeah, I would wait for the regular counter person, too! I just hate it when people whose job it is to know things other people don't . . . don't know those things. It's like a taxicab driver asking you which way to take to get to your destination! I have yet to work with wool fabric, though I have some in my stash that I'm planning to sew up soon. I pre-shrunk it the same way I wash my handknit wool items - handwashed it gently, with some baby shampoo (works just as well as any wool wash). I didn't think to measure whether my swatch shrank or not, though. LOL @ the dry cleaning lady. Great idea to experiment. I got some wool from my aunt so now I know what to try before I sew it. I bought this wool/rayon from Stitches a couple of years ago and was afraid to cut it! I did exactly what you did: the 4" square swatches and tracing. But I decided not to throw the swatch in the washing machine. It's wool and rayon. The fabric is bound to shrink! So I just took the fabric to my neighborhood dry cleaner's and the owner lady there (who is very sweet... she doesn't say a word of english aside from "hello") charged what it would cost to dry clean a wool blanket. Now it's awaiting it's turn at the cutting table. It'll be a retro swing jacket. I have often washed, on gentle, and dried, on low heat, woolen fabrics. I used a Keritin shampoo and conditioner from St. Ives. Wool and hair both are protein fibers. There must have been some shrinkage, but no other obvious changes to the fabrics; perhaps a bit softer. I do not wash them once made up, but I usually do the worst that could happen before the fabric is cut and sewn. I wash rayon too. No problem. The swatch test is a good idea, but I can never tell from a 4" x 4" swatch. A lot of chemicals are used by most comercial dry cleaners, although I've read that there are alternative processes. I believe I heard that some people "dry clean" at home using linen water, but I do not know how that is done. Perhaps someone else will know. Seriously, thanks for the demonstration and chuckle. I'm actually going to do the massive steam treatment at home that Carolyn suggested and dry clean thereafter. Although, all of this made me realize I've had a dress at the drycleaner for the last few months. Hope it's still there. I was going to tell you how talented you are, but Cidell beat me to it. I'm afraid I have no advice about pretreating wool fabrics. Somebody should tell the regular dry-cleaning lady that her co-worker is doing drugs . . . I mean, surely no one could be that out of it without drugs.